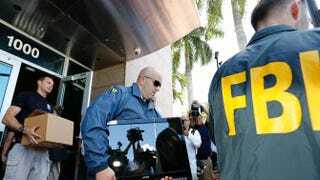 FBI agents carry boxes and computers from the headquarters of the Confederation of North, Central American and Caribbean Association Football after it was raided on May 27, 2015, in Miami Beach. The raid is part of an international investigation of FIFA, the international soccer governing body. An official who sits on the executive committee of FIFA—the body governing the World Cup international soccer competition—was allegedly given $10 million so that he would vote for South Africa to host the 2010 games. That is just one example, American officials say, of how FIFA and marketing executives have been scheming and bribing officials for years to influence soccer matches, the New York Times reports. On Wednesday, U.S. officials indicted 14 soccer officials and marketers for doling out and accepting approximately $150 million in bribes. Most of the charges levied against the FIFA executives stem from racketeering laws that are typically applied to Mafia families and drug cartels, the Times explains. In all, the federal indictment contains 47 counts—charges that range from bribery to fraud and money laundering. Other countries are also bringing charges against FIFA executives. In probably the most public display of the hammer coming down hard on the international soccer organization, Swiss authorities walked into a Zurich hotel Wednesday morning and arrested senior-level FIFA officials. U.S. Attorney General Loretta Lynch, who had been presiding over the FIFA investigation in her former post as a U.S. attorney in New York, remains at the helm now as U.S. attorney general. Lynch described the severity of the charges and vowed that the U.S. had only begun its investigation into the corruption that has run amok in FIFA for the past two decades.